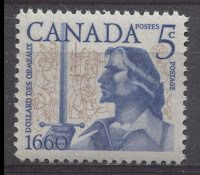 Thus far most of my posts have been about stamps issued prior to Queen Elizabeth's reign. Over the next several weeks, I will be finishing my posts on the remaining issues of the King George VI period, and then I will be writing about the modern Elizabethan issues. Before I get into them though, I wanted to write a post to explain my love for them, how they can be both fun and interesting to collect, why collecting modern stamps differs from collecting classic stamps, and some tips on collecting modern issues. I did not use to like modern material that much. For most of my collecting life, I bought into the conventional wisdom that to be an accomplished philatelist, one has to collect something scarce, or rare, or if not rare, something classic. Although I was always drawn to the colours and the artistic variety of Elizabethan issues, the conventional wisdom that says that these issues are nothing more than discount postage kept me away from collecting them in any serious fashion. However, there came a point in my collecting life where it was no longer important to me to prove myself to other collectors or dealers. It was no longer important to impress people with the catalogue value of my collection, or the rare and expensive pieces in my collection. I am a junkie for varieties. I love looking for the subtle, but real and significant difference between two seemingly identical stamps. Classic philately is full of opportunities to seek out shade, paper, perforation and printing varieties, but what I never realized until much later in my collecting life is that the scope of collectible varieties is much more vast in the modern Elizabethan period. The best part is that the modern issues are extremely affordable. For me much of the fun in collecting lies in the chase, and the thrill of making a new discovery. Because the quantity of modern issues is so vast, because they have been so under-studied, and because they have been so misunderstood, there are many significant varieties that have simply been overlooked. We see this in the number of new listings that get added to Unitrade every year, especially for issues that have been around for 35-50 years now. 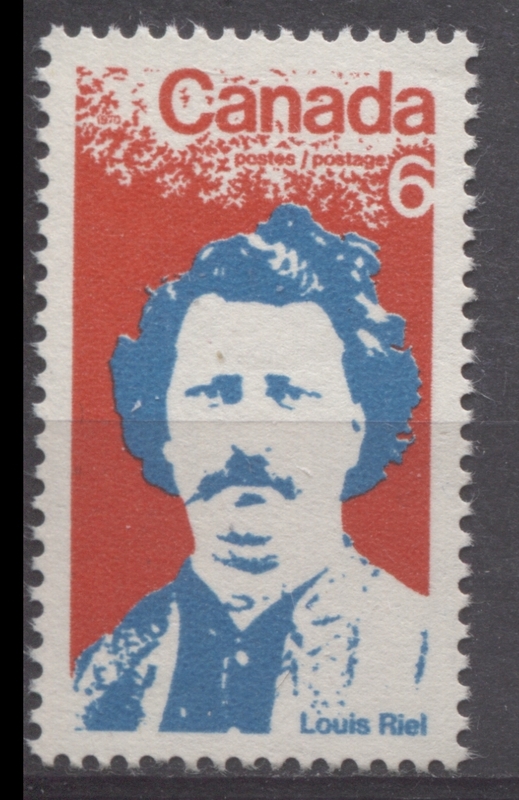 For example, the Louis Riel stamp above exists on at least two types of dull fluorescent paper. I discovered this will going through a quantity of mint singles. One type has a completely smooth surface, and shows no mesh when held up to a strong backlight. Another shows a very light, but visible vertical ribbing on the face, and then clear vertical mesh when viewed against the backlight. 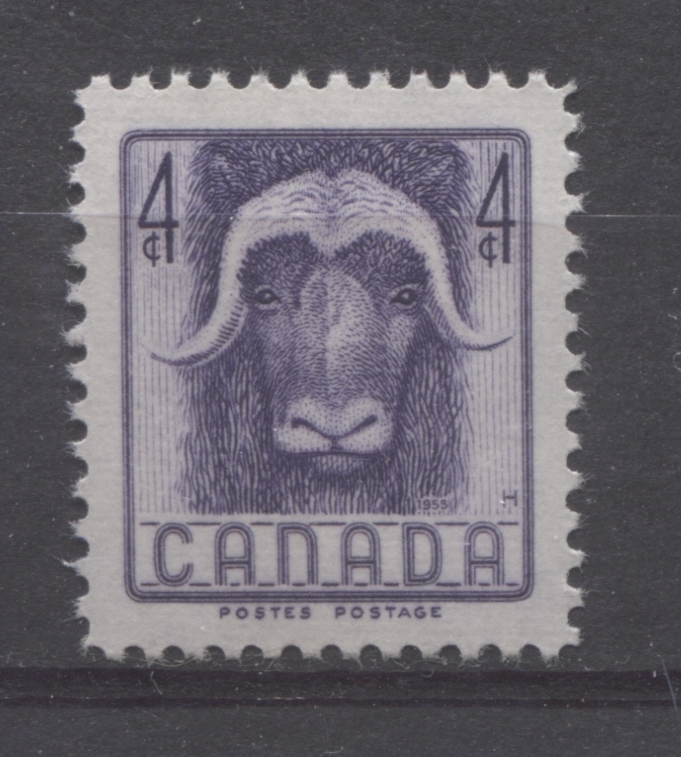 I have found distinct shade varieties of the purple in the Musk Ox stamp in the top left corner above, as well as differences in the surface texture of the paper surface. Finally, on the Dollard des Ormeaux stamp from 1960 in the upper right corner, I have found similar textural differences in the paper used to the Louis Riel stamp, and I have also found significant shifts in the brown background design relative to the blue colour. I have not yet found any significant varieties of the 3c Christmas stamp from 1966, but I'm sure that patience and careful study will eventually turn up at least one. Another fantastic aspect to collecting this period is that you can do it all mint without breaking the bank - for now. I say that because of the fact that for the last 30+ years, dealers have been using these issues as postage, slowly depleting the supply of mint stamps. Of course because many of the significant varieties have been overlooked and have yet to be discovered, it is possible that many of the existing shade, paper and perforation varieties have been used up, or will be if the current foolish trend continues unabated. Thus if you want to truly specialize in this period you probably need to keep an open mind and be receptive to used stamps as well as mint. Finally, if you have to have rare material in your collection, there is no shortage of rarities in the Elizabethan period. Very few of them are regular issues, with most being printing errors. This is good because it allows you to define the scope of your collection initially as say regular issues, which you can complete over time on modest budget. Then as your means allow, you can expand the scope to include the errors, and proof material. But not all rare material need be expensive. You want a lifetime challenge that won't break the bank? Try collecting the se-tenant issues and souvenir sheets properly used on commercial, non-philatelic covers! Some of them will be next to impossible to find as their face value did not correspond with any of the rates that were in effect when the stamps were issued, so that to find them you typically have to look for them used on higher rate mailings in combination with other stamps. I have chosen to collect this period, largely because of my love for it, and also because I can do so without taking material away from my customers - there is enough to go around! Another thing I am excited about is the prospect of producing a super deluxe and comprehensive stamp album for the issues after 1946 - an album that is laid out in a way that allows you to collect in the most detailed manner that you want. To do this though, I have to develop a list of what exists, and to do this I have to collect and study the stamps. This I intend to do over the next several years. Of all the misconceptions surrounding modern stamps is the idea that almost every stamp is different, and so small "flyspeck" varieties, paper varieties and shade varieties mean nothing since there are so many of them. Nothing could be further from the truth. Modern stamps display a degree of uniformity that is incomparable to the early classic stamps. You could sort a pile of 1,000 3 cent Small Queens, and find dozens if not hundreds of varieties. For the stamps shown above, you could sort through a pile of 1,000 stamps for each one, and you would be lucky if you found a dozen varieties of each. 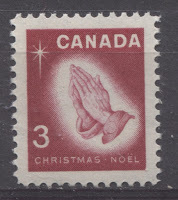 It is even possible with some stamps, like the 1966 Christmas stamp that you sort through 1,000 stamps and you never find a single variety. That is a very good thing, because it means that when you do find a variety, even one that is seemingly quite small, it is significant, and collectible. Except for perforation varieties, watermark varieties and errors, the other areas of interest are very vast due to the technological limitations inherent in production when the stamps were printed. Colours were mixed by hand using formulas, but inexact measurements of pigments, so that shade varieties result every single time a new batch of ink was mixed. As a result, although many specialists will collect every possible shade variety, most collectors will limit themselves to shades that are very obvious to the eye, even without a comparison to another stamp. Similarly, paper was made either by hand or machine. However, paper from this period was uncoated, automatic mail sorting had not yet been invented, recycling of paper was not a |thing", and so fluorescent brighteners were not a part of paper production yet. As a result, the only dimensions along which paper varies to a classic philatelist is texture, thickness, appearance, the direction of the weave, and the watermark if there is one. Classic stamps were either engraved, typographed, or lithographed from plates. These plates got damaged, wore and had to be repaired or re-worked throughout their life. The collection of re-entries, flaws and retouches, is essentially the study of what happened to the plates over the service life. Perforations during the classic period are generally collected and studied to the nearest 1/4 hole, or more often the nearest 1/2 because the in-exactitude of the perforating equipment is such that smaller differences are often not meaningful. Shade varieties - fewer and more subtle in most cases. Paper varieties - all attributes as before, but now with coatings and fluorescence. Tagging - to assist the mail sorting process - both fluorescent and phosphorescent. Gum varieties - different types of dextrose, and PVA gums. Perforations - many finer variations can be found, some being 1/10th of a hole. Constant and non-constant printing flaws. The texture of the surface, i.e. smooth or ribbed. The presence or absence of a coating. Colour - cream or bright white. Thus you should also have a micrometer for measuring paper thickness, and a good magnifying glass to examine the paper surface closely. The nature of the reaction - whether it is phosphorescent, fluorescent or both. The type of tagging - Winnipeg or Ottawa, and for Ottawa, whether it is OP-2, or OP-4. The width of the tagging bars. The absence of tagging on stamps that are supposed to be tagged. The colour of the tagging both in normal light and under UV light. The spacing between tag bars. How solidly the tagging is applied - smooth versus blotchy. The Unitrade catalogue only covers the second though fourth of the above points, but I believe that in years to come this will change. Tagging is essentially a chemical overprint applied to the stamps after printing, so all of the usual aspects of an overprint that are usually studied, such as the spacing, the setting, the type of ink used, should apply to tagging as well. The only difference is that some of those differences will be visible in normal light, and some will not. A phosphorescent reaction is characterized by an afterglow that persists for a few seconds after the light is switched off. You generally need to be in a dark room to see this, but it is quite noticeble. The reaction is usually a bluish white, or yellowish white glow. Fluorescent tagging usually glows bright yellow or bright green, and the glow is completely gone the moment the UV light is switched off. Winnipeg tagging is phosphorescent and Ottawa tagging is fluorescent, although experimental Winnipeg tagging exists that is both fluorescent and phosphorescent. The first Ottawa tagging used a compound called OP-4 that was unstable and migrated, so that OP-4 tagging now gives a fairly pale reaction under UV. The later tagging used OP-2, which is stable and gives a strong solid reaction. The width of the tagging bars varied as well. Winnipeg tagging could be found in widths of 4 mm, 8 mm, and 9-10 mm, while Ottawa tagging ca be found in 2 mm, 3 mm, 3.75 mm and 4 mm widths. The strength of the taggant applied varies as well. You can find some stamps where the tagging is almost invisible in normal light, and then others where it is dark yellow. These, in my opinion are all collectible, because they are evidence of the experimentation that was carried out before settling on the tagging that most all stamps today have. Some of the dextrose gums are streaky, while some are smooth and others grainy. Some of the gums exhibit a high gloss sheen, while others are semi gloss. Still some are a satin sheen or a matte sheen. These differences likely result either from chemical differences in the makeup of the gum or its method of application, so in my humble opinion, they are also collectible. Perforations are another aspect of modern issues that did not receive much attention until the last 30 years or so, mainly because there were thought to be very few varieties. 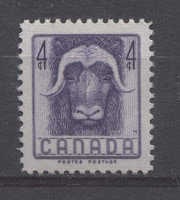 Then in 1988 when the wildlife series was introduced, several perforation changes were made by Canada Post that were never announced. This revived interest in looking at the perforations of modern issues, and has resulted in some very rare stamps. Most issues prior to 1972 are line-perforated, while all perforated stamps after 1972 are comb perforated. It was commonly accepted that unless otherwise stated, all stamps after 1935 were perforated 12. However, that is an over-simplification. There were at least two perforation changes made between 1946 and 1972, and possibly more in the years after. Many of the stamps in the early 1950's will measure exactly 12.0 on an Instanta gauge, but sometime in the late 1950's this was changed to 11.95. 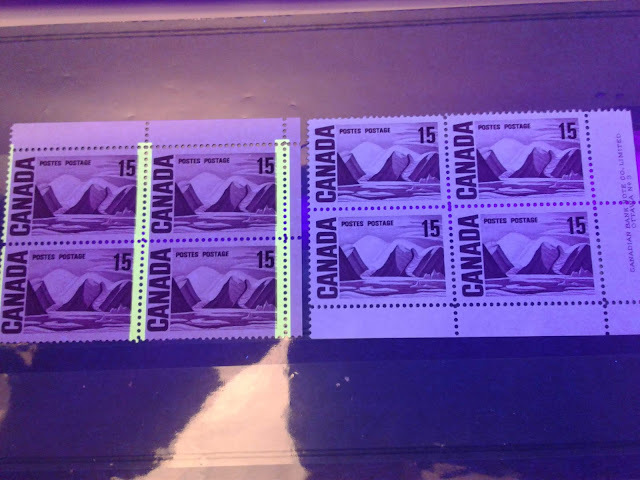 Then again in 1962, it was changed to 11.85 - a measurement that holds for all stamps printed by the Canadian Bank Note Company throughout the remainder of the 1960's. These are seemingly very minute differences, but they are consistent and they can be easily seen with the gauge if used properly and with care. This means that with each change, there was a transition period where compound perforations can be found that were previously unknown. So to collect modern issues properly, you need a perforation gauge, like the Instanta, that will enable you to measure to the nearest .05. Remember though that unless each of the vertical lines on the gauge bisects a perforation tooth exactly in the middle, you do not yet have an accurate reading. Finally. many constant printing varieties have been found on these issues, with more being found every year, as collectors study intact sheets carefully looking for them. Many are quite scarce, occurring only once in a sheet. The wonderful thing is that enough intact sheets still exist to allow philatelists to prove their status as constant varieties. The biggest tip I would give all of you is: TAKE NOTHING FOR GRANTED. Just because Unitrade only lists one perforation, or lists no varieties for a stamp does not mean there are none. You should check all your stamps carefully, using all the tools at your disposal, which includes your perforation gauge, micrometer, loupe, black light, and backlighting. Another tip is to start with singles first. Although it may seem too easy, you might well find once you get into collecting this material that singles represent more than enough of a challenge without getting into plate blocks. Then later on you can expand into plate blocks, complete booklets and even full sheets. That brings me to the end of today's post. I hope this has inspired some of you to give this period another look, or at least convinces you to look at this as more than just postage. Am looking forward to your posts on the modern era. My father was a part-time dealer in the St. Lawrence Valley of New York, and when he passed I inherited not just his collection, but the balance of his dealer stock, and I have at least a dozen dealer books of Canadian singles from the period 1937-late 1980s. Your blogs will be very helpful in going through those books to find hidden gems.